Every Easter Sunday a non for profit group #TheArmorettes have their annual charity event at Midtown Moon in Ansley Square in Atlanta GA 30309. The Easter Sunday Drag Races with games, contests, raffles and more. There are audience participation games where you can get in on all the fun and compete against others. 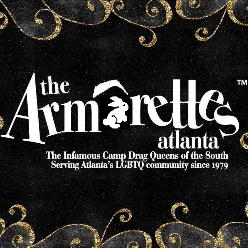 The Armorettes are the infamous camp drag queens of the south who do everything for charity! They focus on people with HIV/AIDS and partnering with local places to help support this amazing need in Atlanta and beyond! This is a No Cover Event and it is held Inside and Out of the venue! The event always draws an amazing crowd and is one of the most anticipated events each year!